The right to own and do what you want with your real property has always been the hallmark of American democracy. The general thrust of this doctrine is that “this land is mine to use, enjoy, and treat as I wish.” Many property owners feel this way about their rights to land, and certainly, landowners possess many rights to the properties they hold. Although the issue of property rights has received a great deal of attention in recent years, it is valuable to remember that property rights have been debated in the United States since the country was formed over 200 years ago. But never in the history of the United States has there been such an attack on the rights of property owners as what is currently going on in California. When this country was original formed property rights were associated with citizenship and the right to vote. That is how important ownership of real property was to the founders of this country. Women and African Americans who owned real property during the formation of our country were given the right to vote in certain States and Settlements. Some important landowner rights associated with the ownership of real property included the right to sell, lease, mortgage, donate, subdivide, grant easements, etc. The public also has the right to tax, take for public use, regulate uses, etc. The landowner according to both common and statutory law has the right to (1) sell (2) lease to a tenant for whatever the market will bear; (3) mortgage-borrow against; (4) subdivide; and (5) grant easements, among others. Rent control and other associated restrictions on a landowners right to lease/rent his or her own real property is a direct attack on the fundamental rights of the landowner.to rent out his or her property for a fair market rent and return on his/her investment in the real property. Some politicians in California suggest the Statewide Rent Control will assist in finding affordable housing for elderly, underemployed or unemployed Vets, the disabled, people on fixed income and many others. However, a careful review of California’s 2018 Ballot Initiative Proposition 10 and related local governmental pushes towards rent control suggest that such measures may have a counterproductive effective on the “claimed purpose” of Statewide Rent Control. How does this erosion of the rights of landowners translate into the restrictions faced by landlords when they evict their tenants? The promulgation of Code of Civil Procedure § 1159-1179a ushered in the statutory rights given to the landlord to evict the tenant and virtually eliminated the landlords right to evict a tenant according to commons law. 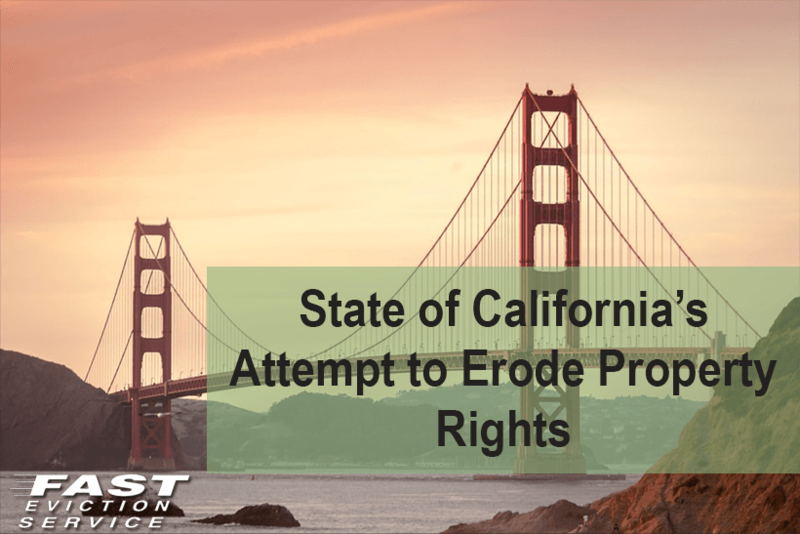 In California a landlord must strictly follow the procedural rules and laws set forth in Code of Civil Procedure 1159 to 1179a if the landlord wishes to evict a tenant. Very generally, an eviction must be started with a Notice to the Tenant to vacate the rental property for a variety of reasons. A 3 Day Notice to Pay Rent or Quit is used when the tenant refuses to pay rent required by an oral or written rental agreement. A Three Day to Perform Covenant or Quit is used to evict the tenant when the tenant refuses to comply with the provisions of the rental agreement other than paying rent. 3 Day Notice to Quit can be used if the tenant is engaged in certain conduct that constitutes a nuisance to the other tenants or neighboring community. Whether a 30 or 60 Day Notice to Quit is served depends upon how long a tenant has resided on the property. A 30 Day Notice to Quit can be used to evict a tenant for no cause if that tenant has lived in the rental property for less than one year. A 60 Day Notice can be used to evict a tenant for no cause if that tenant has lived in the rental property for more than one year. However, the landlord must be careful that he or she is not seeking to evict a tenant for the wrong reason such as for complaining to a governmental agency about the conditions of the rental property – or because the landlord does not like tenant’s gender, ethnicity, national origin, sexual orientation or marital status. A landlord’s right to evict a tenant is being progressively eroded. Each year see’s the passage of more and more legislation restricting a landowner’s use of his or her real/rental property. The election in November and future elections with ballot initiatives that seek to curb a property owner’s rights by controlling rent will be critical to the future of landlords rights to charge a fair market rent for his or her property and to increase the rent in a reasonable manner.